I started this blog in 2005 on LiveJournal. I wanted more control over the format and functionality, so I moved to WordPress in June of 2006. Ever since I’ve used basically the same look and feel — a custom WordPress theme I named Joshua after the son of my online pseudonym. The Joshua theme was based off of Tiga, which saw a lot of use back then. Functionality changed over time, including a top navigation, exposed categories (then hidden in a dropdown box, where they remain as of this writing), most popular posts, more direct access to comments, a search box, and a bunch of other stuff that has gone by the wayside. The biggest motivator for me to update Gibberish is the concept of Responsive Design. Back when I was your age (seriously, it was a long time ago, like 1998 long ago) we used to have to make all sorts of hacks to make Web sites look the same on different Web browsers, screen sizes, and capabilities. In fact, most Web developers still have different versions of sites for different Web browsers. Woe betide the developer who has to support Internet Explorer 6 or 7 in the modern age. On top of all of that stuff, a huge shift occurred about two years ago and it’s still going strong today: more and more people were browsing the Internet on differently-shaped devices. Smartphones and tablets are rising in prominence; so much that research indicates the majority of us will be doing at least some amount of Web surfing on a touch-enabled device by 2015. In addition, televisions are becoming Web-connected, so what was old is new again and we’re dealing with WebTV all over again. Anyway, the old strategy of creating custom Web code for specific Web browsers or devices became a fool’s errand. Even if you could possibly identify and acquire enough devices to code for, there’s always something new around the corner. A new methodology of design and development rose up: Responsive Design. In short, Responsive Design basically compiles a series of attributes about the environment you’re using to read this Web page. Stuff like if you’re using a computer or a television or a Braille reader, or how big your screen is, or your current resolution, etc. Instead of chasing specific devices, now we’re making decisions about what to display based on the makeup of a user’s device. Think of it this way: instead of saying, “Oh, DrFaulken, it’s you! Here’s a special site,” modern Responsive Design states, “You are bald, have long gorilla-like arms, and are usually using a tablet or smartphone. Here’s a special site.” Does that make sense? Probably not. It’s getting late. Here’s an easy and fun way to see the Responsive Design in action: if you’re using a desktop or laptop, make your browser window smaller. Go ahead, grab the bottom right hand corner of the window and then make the window (or “viewport,” in RD terms) smaller. You may need to minimize your window first. 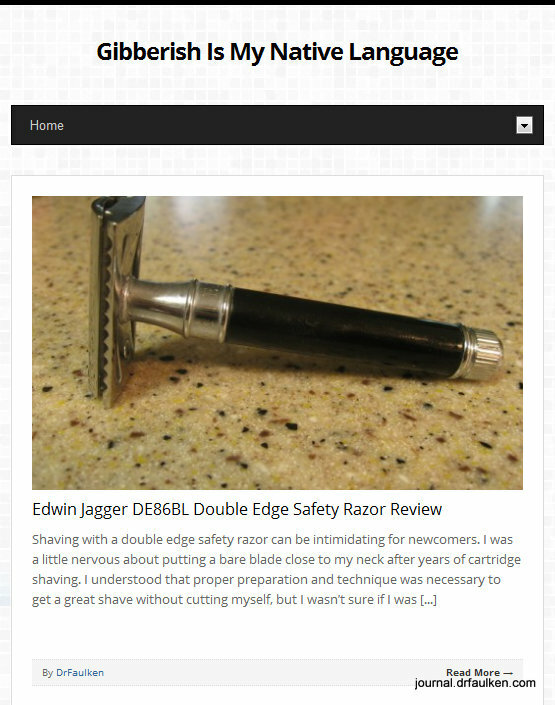 Here we are in 2012, well over seven years from Gibberish’s humble beginnings as a way to share product reviews and recommendations with my friends over vast distances. A lot has changed in the Web world, and I’m consuming (and creating) content in ways I never imagined when this blog started. 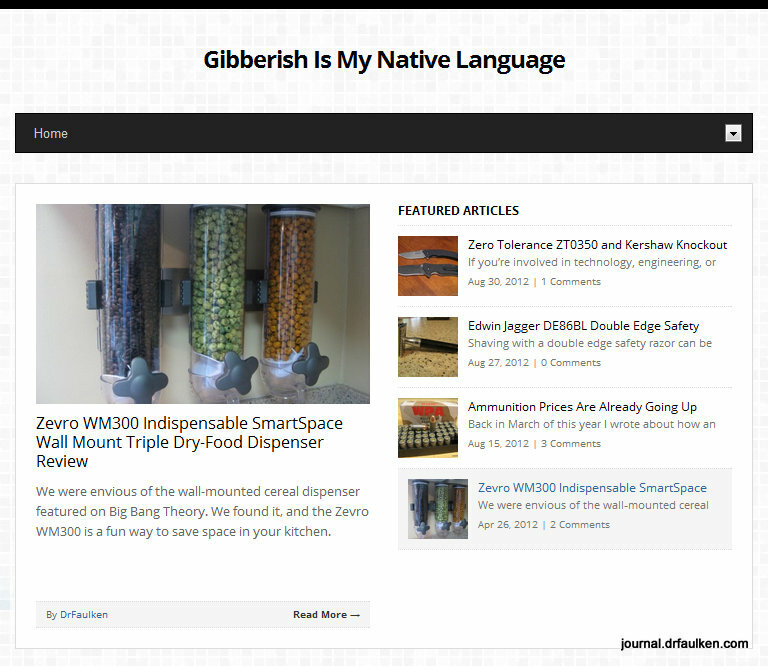 The new Gibberish look and feel is a major step forward, both visually and technologically. I also hope that the modern code will help page load times and page responsiveness, but that remains to be seen. 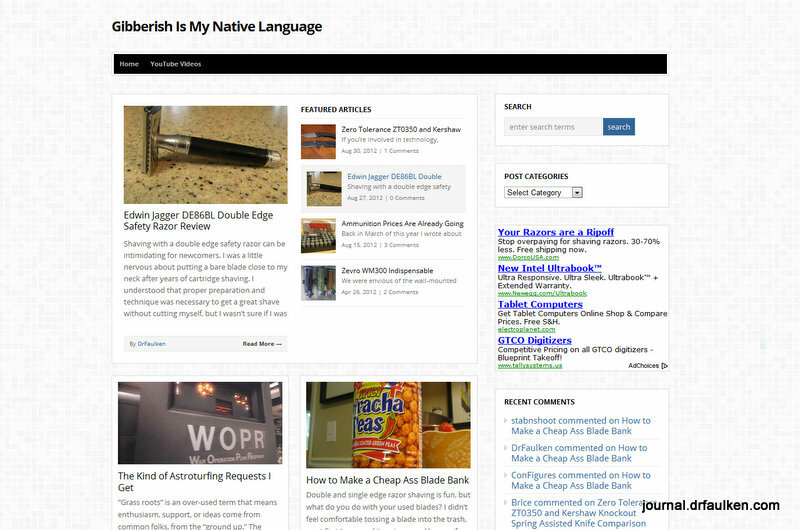 Please let me know what you think of the new design, especially if you encounter a bug. 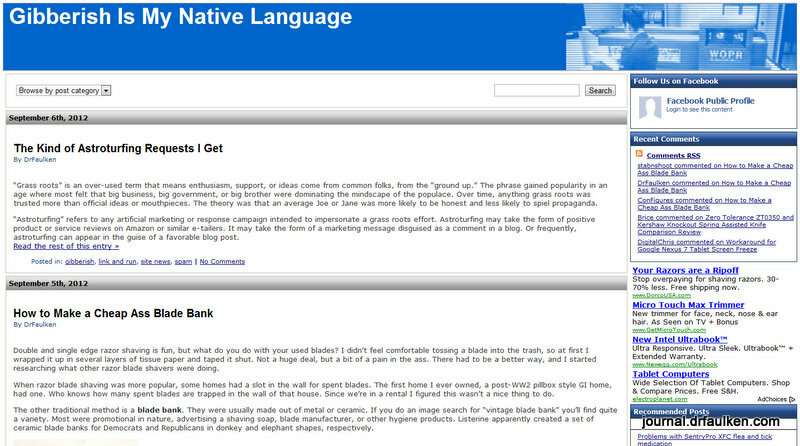 2 Comments on "Gibberish Gets a Facelift"
I went to a presentation by co-workers tonight on Responsive Design! Thanks for the background this post gave me on what they were talking about.